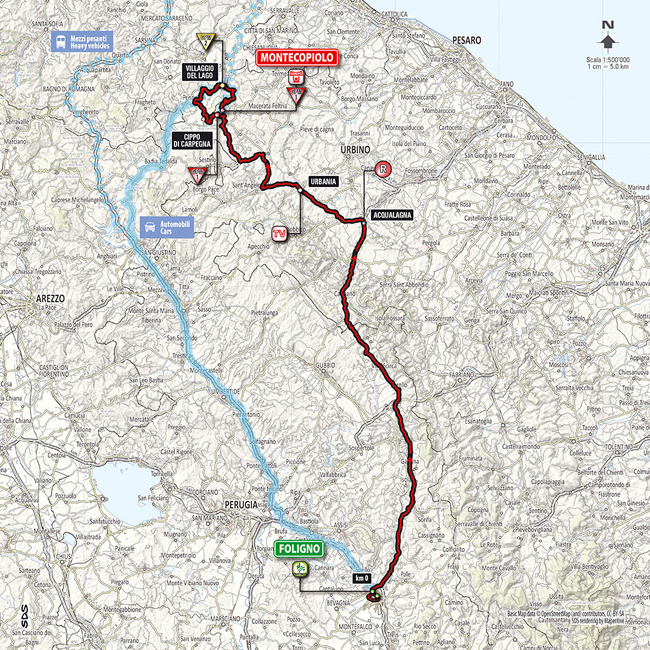 The Race: This weekend's racing will bring a lot of clarity to this year's Giro, with both Saturday's and Sunday's stages having summit finishes. 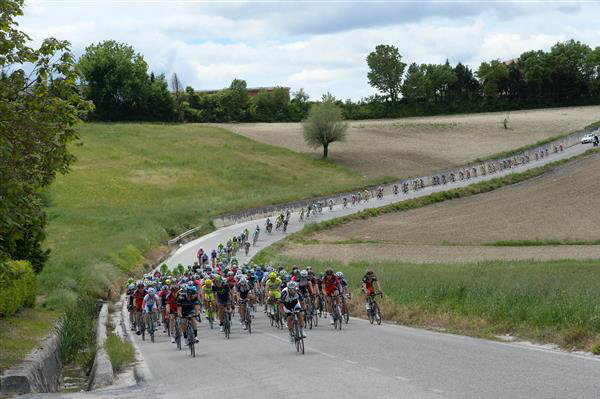 It is one of three stages in this year's edition dedicated to Marco Pantani. 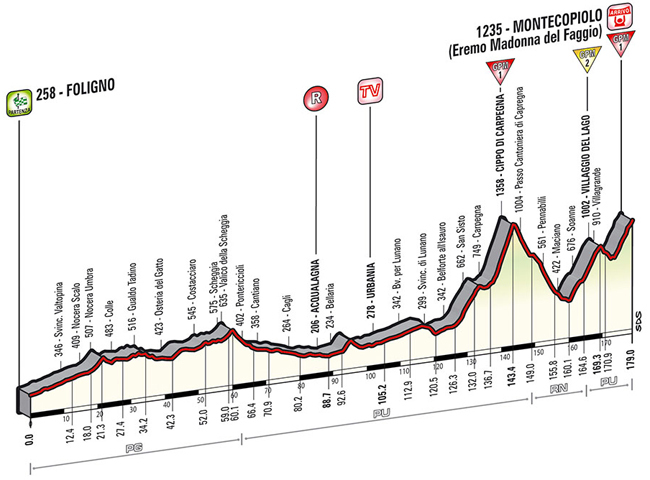 The situation with 16 km to go, on the penultimate climb: Trek rider Julian Arredondo has left the day's break behind with a 70-second lead on Stefano Pirazzi and Pierre Rolland, a trio with Edvald Boasson Hagen chasing and the group with the main contenders 2min 40sec behind Arredondo. Maglia Rosa Michael Matthews was dropped long ago and Astana hope Michele Scarponi was struggling and losing time. His GC ambitions were clearly over. Over the crest of the Villagio del Lago, Arredondo was hanging tough, maintaining a minute gap to Rolland and 1min 46sec to the Cadel Evans group, led by Ag2r. Under the 5km banner Rolland has closed to within 40 seconds of Arredondo, who was beginning to rock in his saddle and look tired, and the Evans group was 1min 20sec back. Just past the 3 km mark Rolland caught and later dropped Arredondo, but the Evans group, led by BMC rider Steve Morabito, was just 45 seconds behind. Rolland went under the red kite with just 15 seconds. Daniel Moreno went after Rolland and then the rest of the chasers went by the Frenchman as well. 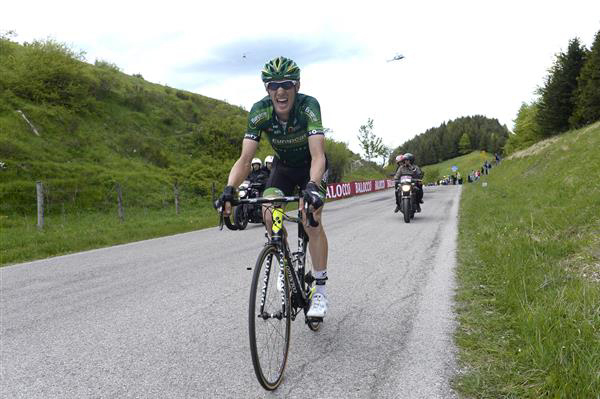 Diego Ulissi unleashed a magnificent attack with Robert Kiserlovski going with him. 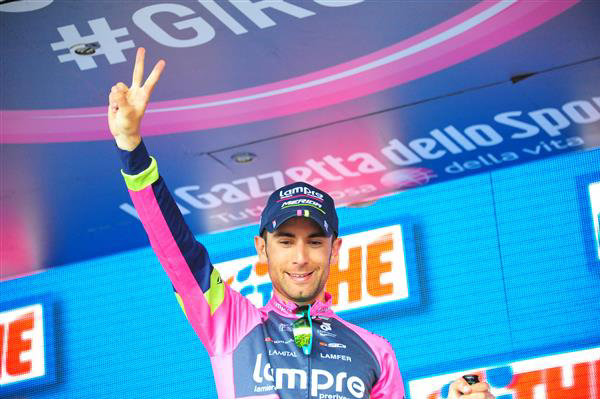 But Ulissi was not to be denied and took an impressive stage win. 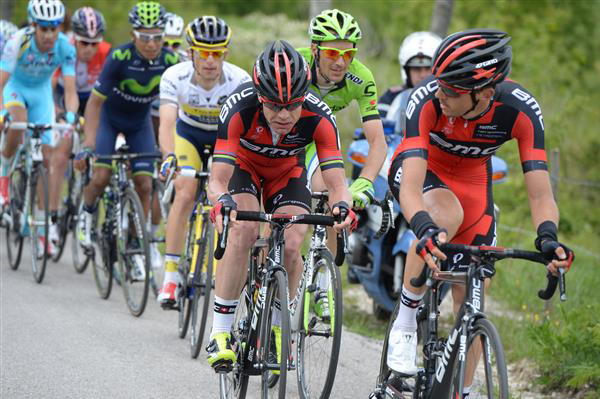 Cadel Evans, finishing fifth today, takes over the maglia rosa with a 57-second lead over Rigoberto Uran. Julian Arredondo on his solo quest for a stage win. Michael Matthews during his last moments in pink. 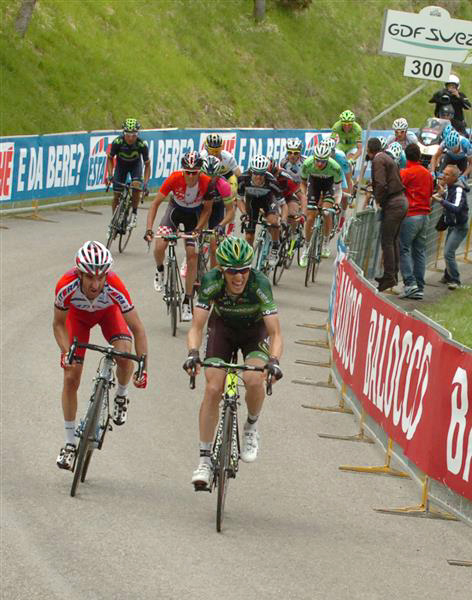 Steve Morabito leads Cadel Evans up the final climb. Daniel Moreno (red Katusha kit) and the rest of the chasers overtaking lone breakaway Pierre Rolland. 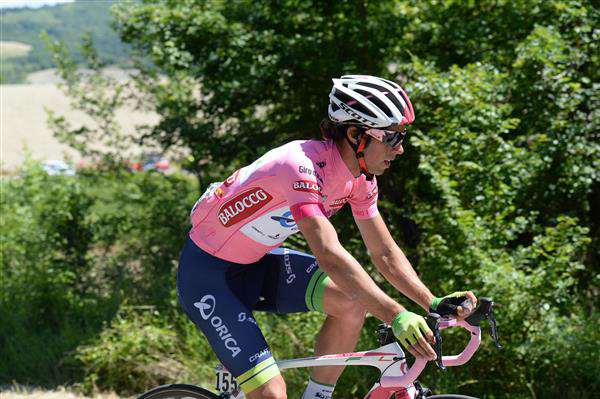 Diego Ulissi's powerful attack was perfectly timed. Robert Kiserlovski finished second today.